Filson Weatherproof Tote. 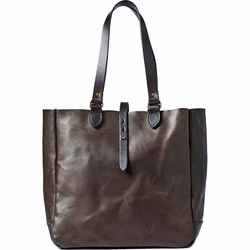 Carry tools, shooting supplies or any other necessities - the Weatherproof Leather Tote Bag does it all, for a lifetime. Built with Filson's proprietary Weatherproof Leather that’s specially treated during the tanning process for lasting water protection. Outfitted with vegetable-tanned Bridle Leather handles and solid brass hardware.